The Irish Fellowship Club of Chicago was established in 1901, before the Republic of Ireland became a country. Learn its history and legacy through images and stories in this one-of-a-kind exhibit curated by Irish Fellowship Club of Chicago President, John Griffin. A historical look at the influence of the Irish Fellowship Club of Chicago (IFC) on the aspirations for Irish independence. The leverage of the Irish diaspora was profound in its political and cultural support. Many members of the IFC were daring and bold in their support of Ireland’s independence. Irish leaders recognized the importance of close ties to America’s influential Irish. No one was more sympathetic than Edward Fitzsimmons Dunne, the first president of the IFC. He also remains the only man to be both Mayor of Chicago and Governor of Illinois. He reflects the IFC’s pedigree for loyalty to the Irish cause and its high prestige in public life. He joined the small American Irish delegation that traveled to the treaty talks at Versailles following World War I to have Ireland's wishes for independence met. 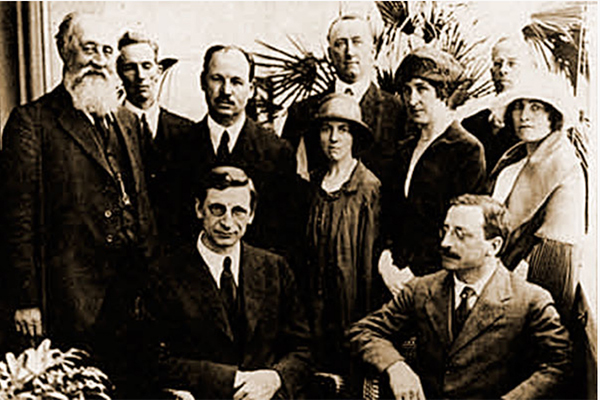 Irish leaders, like Eamon DeValera, came to Chicago to lobby for support of America’s non-Irish political influence. The record of the IFC is a worthy record of political and sentimental support for the great dream of Irish freedom. A presentation by IFC historian in residence Thomas J. O’Gorman will be accompanied by a display of historical photos from the IFC archives.